A hypothesis is and educated proposition or guess attempting to explain a natural phenomenon or particular set of facts. It mostly applies in the science field with scientific methods for testing it. A hypothesis should be logical. You should write it in the form where it explains a likely occurrence after a particular action. Writing a hypothesis is such a scientific process. It helps to get someone to check if you wrote it well and if it is valid. Academic Writers Bureau offers professional hypothesis editing services to help in determining if it leads to the right direction for a project. The extent to which you can test it with experimentation or research. A viable hypothesis has a basis on information, not an assumption. Academicwritersbureau.com goes beyond the text or sources suggest by a professor to interpret the relevance of information. Our editors studied science subjects in university and utilized their academic knowledge to determine if your hypothesis is something that you can prove mostly by experiment. If it does not, your editor will amend it to present ideas concisely. They will identify the mistakes on your hypothesis and correct them accordingly. AWB hypothesis editors are Masters and Ph.D. degree academicians from reputable universalities. Their high academic standards help clients to achieve academic goals since editing of their work is by a professional. We ensure that you get the best hypothesis editing help by matching them with a professional from their field of study who has a clear understanding of the objective of your venture. Our editors are part of an in-house team. We do not use freelancers as their credibility is hard to verify and our principle is to work with someone who offers high-quality editing to our customers. Academic Writers Bureau meets your requirement 100%. We do not leave your hypothesis until you are fully satisfied. We have an experienced team of editors who become part of us after rigorous vetting. We only assign your order to someone who we have proven to have an ability to edit entirely. At the end of editing, you will have a hypothesis that is logical for your project. Your editor will also remove any grammar errors and plagiarism. Our editing service included free revision for a customer who may be unsatisfied with the first editing of their hypotheses. Are you Stressed About Getting an Intellectual Editor to Refine your Hypothesis? Get a feel of our editing professionalism. Our editors are analytically skilled to work on your hypothesis with diligence. We guarantee you 100% amazing results. Will AWB find an expert to edit my hypothesis? We have a large pool of editors for almost all subject areas taught at universities. We will find an expert in the same topic as your hypothesis. Is there a guarantee that my hypothesis will be unique? We edit each order according to its requirements. It is our reason for assigning editing to experts in the field. We offer various turnaround options for our clients to choose. We deliver you order on the stated deadline. 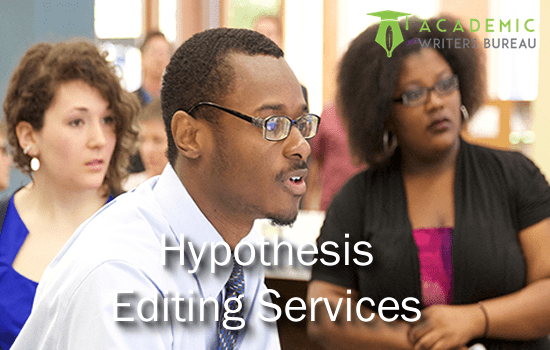 Pay for hypothesis editing through PayPal, credit or debit card. Our secure system maintains the privacy of your personal and card details. What if I am not satisfied with your editing? Our, online hypothesis editing service includes free revision till you are satisfied. Let our Editors Work on Your Hypothesis. My hypothesis was not aligning well for my project until I got an AWB editor. After the personalized editing to match my project requirements I can now move on without challenges. I had used other editing services before I discovered Academic Writers Bureau and none meets its editing standards. I recommend AWB editing to anyone with a scientific project. It has experienced editors who perform careful editing and explain the reason for the amendments.